We saw this handsome picture on a routine visit to Warrnambool, Victoria, Australia. 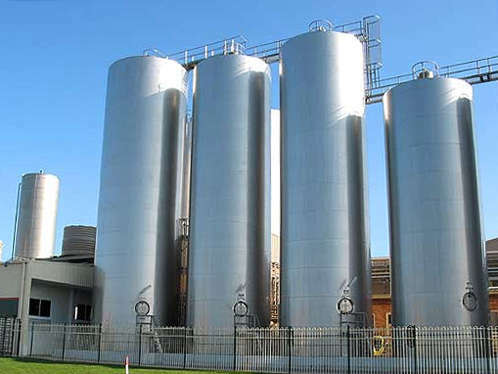 Apart from the fact that we appreciate the visual beauty of many large scale industrial plants, this one has a special appeal: inside those silos are held the million litres of milk that are daily converted to butter and cheese. Having recently discovered that cheese contains casomorphines, and with morphine having long been our own recreational drug of choice [this is JOKE, albeit weak and in bad taste, born of a sincere gratitude for many pleasant hours of drug induced pain free day dreaming after major surgery - Ed.] we now understand why cheese is so popular. This story just goes on getting better - across the road from the cheese and butter factory there is a cheese and butter museum! Cheeseworld is not only a museum, they have local wines, and nice looking restaurant. It's good to see plain white starched tablecloths in this age of over casual dining. Imagine being able to offer one's guests some Pont Leveque Warrnambool accompanied by a hearty glass of the Allansford '96 Montepulciano. After all these delights you may continue your journey to view the Apostles: Cheeseworld stands at the junction of Princes Hwy. with the Great Ocean Rd., which is a magnificent scenic route along the coast. American movie star (1962- ). Like yesterday's subject, Arnold Schwartzenegger, this man plays tough guy parts. We said that Arnie's 6'2" height was insufficient to get him the TV part of 'The Incredible Hulk', but this man seems to have had no problem with his own 5'8" height. He is a 5th grade Black Belt in Capoeira, a Brazilian performing martial art. His big break came in the 16 minute long music video for 'Bad', as the gang leader who menaces Michael Jackson, though he is only seen in the black and white section, which is usually cut for TV airing. Information on the IMDB (Internet Movie Database) web site was used in the preparation of this mini bio.